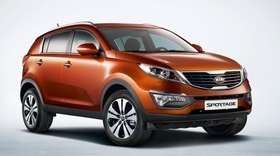 Kia is benefiting from rising demand for SUVs such as its new Sportage. BRATISLAVA, Slovakia (Bloomberg) -- Kia Motors Corp. expects to increase output at its Slovak factory by 5.3 percent next year, led by rising demand for SUVs. The Slovak unit of the South Korean carmaker plans to assemble about 240,000 vehicles in 2011 in Zilina, Slovakia, up from 228,000 targeted for this year, said Dusan Dvorak, a spokesman for the unit. The factory will also increase production of engines by 50 percent to 450,000 units, he said. Kia and its affiliate Hyundai Motors Co. are seeking to tap rising demand for SUVs to gain market share in Europe as the economy struggles to recover from economic crisis. Kia's European sales rose 3.8 percent in January to November from a year earlier, while Hyundai sold 3.9 percent more cars in the same period, according to industry group ACEA. SUVs have represented more than half of Kia's Slovak output this year, up from about 20 percent in 2009 when 150,000 cars were assembled, Dvorak said. The carmaker this year in Zilina began to produce a new generation of its Sportage SUV and started assembly of Hyundai's ix35 SUV. It also makes Cee'd compact cars in the 1 billion-euro factory ($1.3 billion) that became operational in 2006.